Except for a few notable examples such as the incredibly life-like humanoid robots coming from Japan, the overwhelming majority of robots today are either educational tools, special function equipment for performing highly precise tasks (surgical, exploratory, search & rescue), or part of high volume production lines. Back in 1940 when this 'Telecan' robot debuted, people though of robots almost exclusively as autonomous devices that would some day make life easier for the human race, or eventually conquer and subdue the human race into slavery. Constraining robots to the relatively inefficient layout and proportions of homo sapiens, as engineers have discovered, greatly limits their utility. This little gadget is a guaranteed "crowd stopper" for your window. He is called "Telecan," because he is made from old cans and a coffee pot and anything with "tele" tacked on the front sounds somewhat mysterious. Telecan stands 36 inches high in his bare feet and weighs about 20 pounds, he has a normal chest expansion of 28 inches because his body is a square two gallon oil can. His eyes are 6T5's and his head will shake a vigorous "No" at anybody. The passerby operates Telecan by placing his hand over a square metal plate fastened to the inside of the window. Here's the secret. The metal plate is connected electrically, but quite invisibly into a balanced circuit. When window shopper places his hand over the plate he forms a condenser and upsets the balance, a relay thuds home, and behold, Telecan's eyes blink knowingly at him while his head shakes, "No, No." 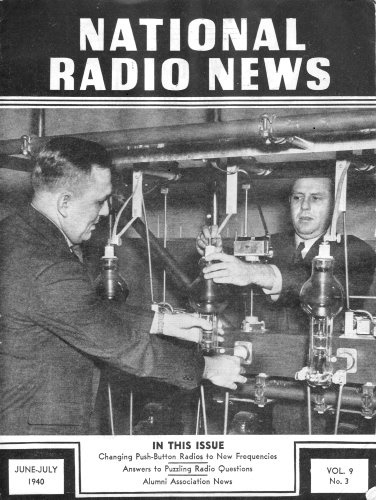 Telecan was built by Felix Sapanero and Harold Z. Snyder, both N. R. I. men, in business as Maryland Radio Service, 1504 W. Baltimore St., Baltimore, Md.